The "Agriturismo Sant’Anna" is not only a Green Tourism destination, but it also represents a good opportunity to taste and buy the typical products of the Tuscan countryside. 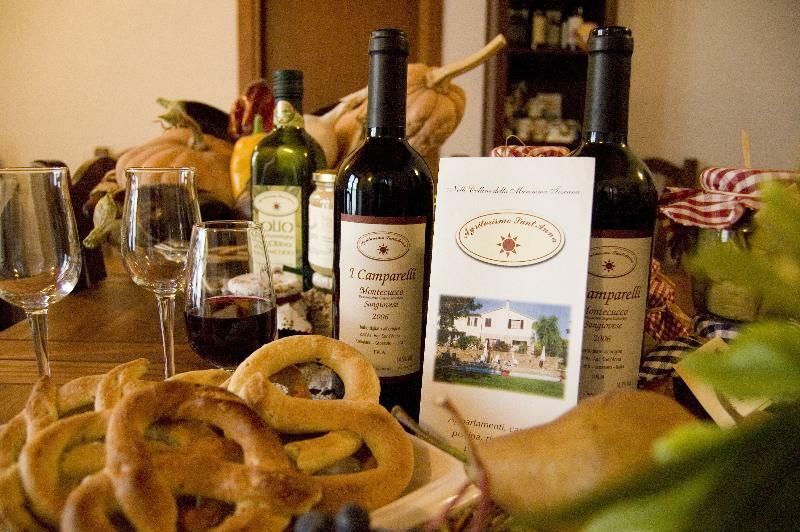 The farm produces wine, oil, honey, jams and “sottoli” (food preserved in oil), which are all made using traditional, natural and homemade methods. The extra-vergine olive oil (“first quality olive oil”) of the Farm Sant’Anna has got the quality certification from the Consorzio dell’Olio Toscano ( Association of Tuscan olive oil ) and boasts of having the IGP mark “Olio Toscano”. The farm is located in the so-called area “Montecucco DOC” ( controlled denomination of origin ). Our wine, “Montecucco DOC”, entirely reflects the standard way of production , both in terms of features of the vineyards and in terms of harvest and wine-making methods.